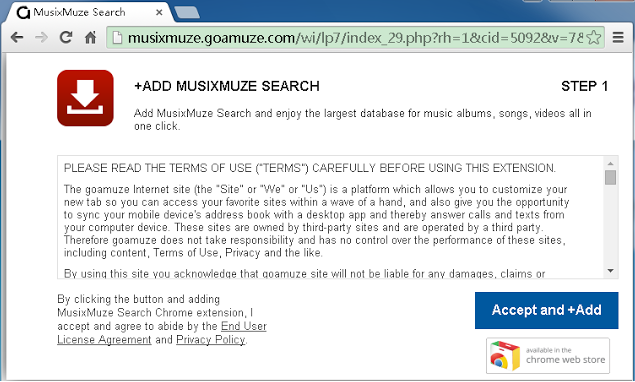 If you install MusixMuze Search on your system, you will notice musixmuze.searchalgo.com set instead of your regular homepage and search engine. MusixMuze Search claims to be able to provide the best search results, so it is not surprising why so many users download and install MusixMuze Search themselves. If you have not done that but still see MusixMuze Search every time you open your Internet Explorer, Google Chrome, and Mozilla Firefox browsers, you need to remove MusixMuze Search as soon as possible and then set another homepage and search engine. Do not worry; it is not so difficult to uninstall MusixMuze Search. Besides, we are ready to help you with that in this article. How does MusixMuze Search act? A new search engine and homepage will be set after the installation of the MusixMuze Search extension. The search engine itself looks quite decent; however, we cannot call it like that because it might provide users with the modified search results. Yes, it will also provide easy-access links that will lead to popular websites; however, we cannot guarantee that it will not redirect you to a bad web page instead of taking to Facebook or another similar webpage. If you do not want to be exposed to threats, you need to delete MusixMuze Search as soon as possible. Of course, this is not the only reason why you need to do so. According to specialists, MusixMuze Search can also violate privacy by collecting and then sending all kinds of details to third parties. Unfortunately, cyber criminals might have an access to this information too. We are sure that you do not want to risk experiencing privacy and security-related issues, so we suggest that you delete MusixMuze Search as soon as possible. We are sure that you will find another search engine instead of it because there are many reliable ones available on the web. How did MusixMuze Search enter my system? There is a possibility that you have downloaded and installed MusixMuze Search yourself; however, it is still more likely that this extension has entered your system together with other programs. This is especially true if you have recently downloaded and installed some kind of program from a third-party web page. You should be much more careful on the web in the future. In addition, it is highly recommended to install a security tool on the system. It must be 100% reliable. How to delete MusixMuze Search from browsers? MusixMuze Search is a simple extension, so it is very likely that it will disappear after you remove extensions from browsers. Of course, you might find it hard to remove MusixMuze Search from the system if you have never tried erasing the extension. Luckily, there is a way to implement the automatic MusixMuze Search removal. All you need to do if you want an automatic tool to perform the MusixMuze Search removal for you is to acquire a security tool and install it on the system. The best thing about an automatic tool is that it will protect the system from future harm too.